In 1897, when Virginia O’Hanlon was 8 years old, she wrote the following letter to The New York Sun on the advice of her father. Virginia’s letter was answered by Francis Pharcellus Church, a former Civil War correspondent, and appeared on the editorial page of The New York Sun on Sept. 21, 1897. 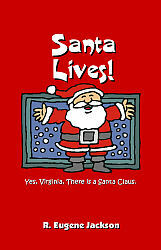 Entitled “Is There a Santa Claus?” the editorial began with the opening line, “Virginia, your little friends are wrong. They have been affected by the skepticism of a skeptical age.” Over the years, Church’s reply has become known for its most famous line, “Yes, Virginia, there is a Santa Claus” and has become the most reprinted editorial to ever run in an English language newspaper. Laura Virginia O’Hanlon Douglas (1889-1971) married Edward Douglas, had a daughter, and became a teacher in New York City in 1912 and a principal in 1935.